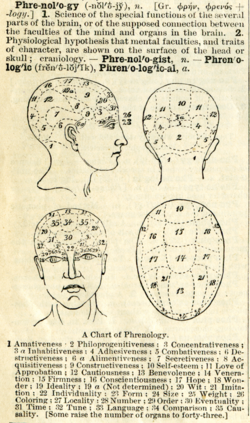 A 19th century phrenology chart. The inscription on the neck reads, "Know yourself." Phrenology is a theory which claims to be able to determine character, personality traits, and criminality on the basis of the shape of the head (by reading "bumps" and "fissures"). Developed by German physician Franz Joseph Gall around 1800, phrenology was based on the concept that the brain is the organ of the mind, and that certain brain areas have localized, specific functions (such as Brodmann's areas) or modules. These areas were said to be proportional to a given individual's propensities and the importance of a given mental faculty, as well as the overall conformation of the cranial bone to reflect differences among individuals. The discipline was very popular in the nineteenth century, influencing early psychiatry and modern neuroscience. However, phrenology was soon found to be too simplistic. While the brain indeed has localized functions, these do not correspond to the level of complexity that Gall described. Psychological functions, the activity of the mind, are not the product of the size or shape of the skull or even brain alone. While the brain may be capable of particular functions to a greater or lesser extent, the individual must exercise these abilities in order to achieve that potential. Also, these localized functions are not as specific as Gall suggested—there is no organ for murder or poetry, although there are parts of the brain that are specialized in hearing, aggression, and so forth. Thus, phrenology was a failure in terms of its worth in predicting the internal nature of a person from the external shape of the skull. Unfortunately, however, it was also misused by making judgments of the value of a person based on such measures. In this sense, phrenology was not merely an amusing pseudoscience, that was an overextension of its scientific basis, but actually became a tool for evil at the hands of those who sought methods to advance their self-centered views. The term phrenology comes from a combination of the Greek words φρήν, phrēn, which translates as "mind," and λόγος, logos, which means "knowledge." Phrenology, hence, is the study of the mind. Phrenology, which focuses on personality and character, should be distinguished from craniometry, which is the study of skull size, weight, and shape, and physiognomy, the study of facial features. Phrenology was not the first academic discipline to attempt to connect specific human characteristics with parts of the body: the Greek philosopher Aristotle attempted to localize anger in the liver, and Renaissance medicine claimed that humans were composed of the Four humors. Phrenology was certainly influenced by these earlier practices. That the brain is composed of as many particular organs as there are propensities, sentiments and faculties which differ essentially from each other. Through careful observation and extensive experimentation, Gall believed he had linked aspects of character, called faculties, to precise organs in the brain. Gall's most important collaborator was Johann Spurzheim (1776-1832), who successfully disseminated phrenology in the United Kingdom and the United States. He popularized the term "phrenology." One of the most significant developments to come out of phrenology was the movement away from considering the mind in an esoteric manner, but rather as an outgrowth of a physical organ (the brain), which could be studied with scientific observation and methodology. While not directly correlated, phrenology thus set the stage for the science of psychology. 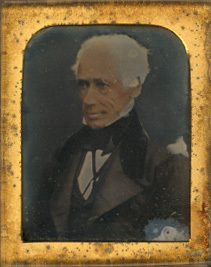 Other significant authors on the subject include the Scottish brothers George Combe (1788-1858) and Andrew Combe (1797-1847). George Combe was the author of some of the most popular works on phrenology and mental hygiene, including The Constitution of Man and Elements of Phrenology. George Combe was a writer on phrenology and education. In the Victorian age, phrenology was often taken quite seriously. Thousands of people consulted phrenologists to receive advice in various matters, such as hiring personnel or finding suitable marriage partners. However, phrenology was rejected by mainstream academia, and was excluded from the British Association for the Advancement of Science. 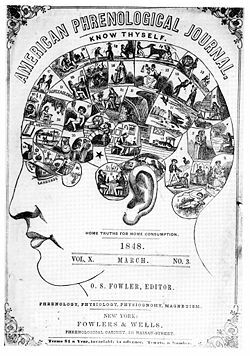 The popularity of phrenology fluctuated throughout the nineteenth century, with some researchers comparing the field to astrology, chiromancy, or merely a fairground attraction, while others wrote serious scientific articles on the subject influencing early psychiatry and modern neuroscience.. Phrenology was also very popular in the United States, where automatic devices for phrenological analysis were devised. As in England, however, phrenology had a lackluster image in the eyes of the scientific community. 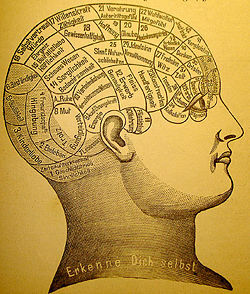 In the early twentieth century, phrenology benefited from revived interest, partly fueled by the studies of evolutionism, criminology, and anthropology (as pursued by Cesare Lombroso). The most prominent British phrenologist of the twentieth century was the famous London psychiatrist Bernard Hollander (1864-1934). His main works, The Mental Function of the Brain (1901) and Scientific Phrenology (1902) are an appraisal of the Gall's teachings. Hollander introduced a quantitative approach to the phrenological diagnosis, defining a methodology for measuring the skull, and comparing the measurements with statistical averages. Empirical refutation induced most scientists to abandon phrenology as a science by the early twentieth century. For example, various cases were observed of clearly aggressive persons displaying a well-developed "benevolent organ," findings that contradicted the logic of the discipline. With advances in the studies of psychology and psychiatry, many scientists became skeptical of the claim that human character can be determined by simple, external measures. Phrenology was a complex process that involved feeling the bumps in the skull to determine an individual's psychological attributes. Franz Joseph Gall first believed that the brain was made up of 27 individual 'organs' that created one's personality, with the first 19 of these 'organs' believed to exist in other animal species. Phrenologists would run their fingertips and palms over the skulls of their patients to feel for enlargements or indentations. The phrenologist would usually take measurements of the overall head size using a caliper. With this information, the phrenologist would assess the character and temperament of the patient and address each of the 27 "brain organs." This type of analysis was used to predict the kinds of relationships and behaviors to which the patient was prone. In its heyday during the 1820s-1840s, phrenology was often used to predict a child's future life, to assess prospective marriage partners, and to provide background checks for job applicants. Gall's list of the "brain organs" was lengthy and specific, as he believed that each bump or indentation in a patient's skull corresponded to his "brain map." An enlarged bump meant that the patient utilized that particular "organ" extensively. The 27 areas were highly varied in function, from sense of color, to the likelihood of religiosity, to the potential to commit murder. Each of the 27 "brain organs" was found in a specific area of the skull. As the phrenologist felt the skull, he could refer to a numbered diagram showing where each functional area was believed to be located. The instinct of reproduction (located in the cerebellum). The love of one's offspring. The instinct of self-defense and courage; the tendency to get into fights. The carnivorous instinct; the tendency to murder. The feeling of property; the instinct of stocking up on food (in animals); covetousness; the tendency to steal. Pride; arrogance; haughtiness; love of authority; loftiness. Vanity; ambition; love of glory (a quality "beneficent for the individual and for society"). The memory of things; the memory of facts; educability; perfectibility. The sense of places; of space proportions. The memory of people; the sense of people. The sense of language; of speech. The sense of sounds; the gift of music. The sense of connectedness between numbers. The sense of mechanics, of construction; the talent for architecture. The sense of satire; the sense of witticism. Kindness; benevolence; gentleness; compassion; sensitivity; moral sense. The faculty to imitate; the mimic. The firmness of purpose; constancy; perseverance; obstinacy. Phrenology has long been dismissed as a pseudoscience, in the wake of neurological advances. During the discipline's heyday, phrenologists including Gall committed many errors in the name of science. Phrenologists inferred dubious inferences between bumps in people's skulls and their personalities, claiming that the bumps were the determinant of personality. Some of the more valid assumptions of phrenology (such as that mental processes can be localized in the brain) remain in modern neuroimaging techniques and modularity of mind theory. Through advancements in modern medicine and neuroscience, the scientific community has generally concluded that feeling conformations of the outer skull is not an accurate predictor of behavior. Phrenology was practiced by some scientists promoting racist ideologies. During the Victorian era, phrenology was sometimes invoked as a tool of social Darwinism, class division and other social practices which placed one group lower than another. African Americans and others were unfairly evaluated when included in early phrenologically-based racism. Later, Nazism incorporated phrenology into its pseudo-scientific claims, which were often self-contradictory, among other "biological evidence," as a "scientific" basis for Aryan racial superiority. 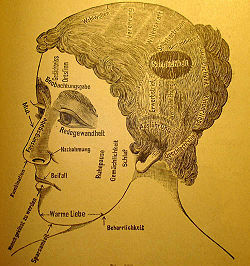 Most often, phrenology was used in literature during the nineteenth century. Among some of the authors to use phrenological ideas were Charlotte Brontë, as well as her two sisters, Arthur Conan Doyle and Edgar Allen Poe. Whether these authors believed in the legitimacy of phrenology is open to debate; however, the criminological theorems that came from phrenology was often used to create an archetype of nineteenth century criminals. ↑ Phrenology. (n.d.). Online Etymology Dictionary. Retrieved October 02, 2007, Dictionary.com. ↑ "phrenology" The Oxford Companion to the Body. (Oxford University Press, 2003). Answers.com. Oct. 2, 2007. ↑ phrenology The Oxford Companion to the Body. (Oxford University Press, 2003). Answers.com. Oct. 2, 2007. ↑ phrenology Encyclopedia of Occultism and Parapsychology. The Gale Group, Inc, 2001. Answers.com. Oct. 2, 2007. ↑ Erik Grayson. "Weird Science, Weirder Unity: Phrenology and Physiognomy in Edgar Allan Poe." Mode 1 (2005): 56-77. Applegate, Debby. 2006. The Most Famous Man in America: The Biography of Henry Ward Beecher. Doubleday. Carey, Stephen S. 2004. The Beginner's Guide to Scientific Method. Thomson. Spurzheim, Johan Gaspar and George Combe. Frederick H. Hurd (Editor) 2007. 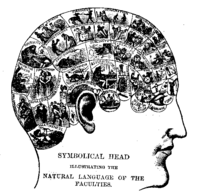 Readings in Phrenology, Selections from Original Texts by George Combe and Johan Gaspar Spurzheim. Sierra Madre Bookshop. Phrenology: The History of Cerebral Localization. Article by Renato M.E. Sabbatini, in Brain & Mind. The Skeptic's Dictionary. By Robert Todd Carroll. This page was last modified on 27 March 2019, at 15:04.